Some people with mental health problems choose to work for themselves. In this film we meet people with a variety of micro-businesses at different stages of development. We learn about their journey so far, their plans for the future and the pros and cons of self-employment. Drew Tomlinson is developing his business (a mobile, wood-fired pizza oven) and describes how he got started and his ideas and plans for the future – click here. 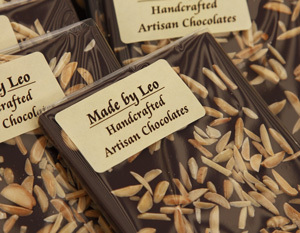 Leo Melchior is a chocolatier making hand crafted, artisan chocolates and selling them through a variety of outlets. 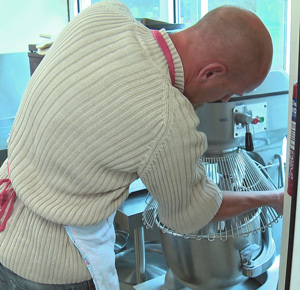 We see Leo at work and he tells us about his journey to self-employment – click here. Jon Pitts talks about MiEnterprise, a pioneering Community Interest Company that supports people to set up their own business – click here. Lorna Jones is a skilled seamstress and she describes how she has developed her business so she can manage her mental health difficulties but carry on working – click here. Alex Hicks describes some of the successes of Focus Enterprises and how they have supported people with mental health difficulties to set up their own micro-business – click here. Jason Clarke is an artist making powerful and dramatic pictures. He tells us how he came to discover this talent and we learn about his plans to market his work more widely – click here. Mike Jones now works as a trainer and as a consultant. He describes the work that he does, why he chose self employment and the pros and cons of this – click here. The films of these entrepreneurs are available on DVD. Do contact us for details. Extremely interesting and informative. Encouraging to “meet” these great people who are so positive and determined to make a go of being self-employed. Film does an excellent job of showing how beneficial self-employment can be for people who have encountered real difficulties trying to hold down traditional employment while coping with mental health issues. Great film! Despite the well-measured portrayal of the pros and cons, it makes a powerful case for self-employment being an exceptional route for helping ease a potentially large segment of currently hopeless and chronic mental health sufferers back into society. To hear, in their own words, these people describe their journey to self-worth was very moving. And the civic support groups interviewed were a revelation to me; I had no idea that such thoughtful programs were in place. I hope a lot of people get a chance to see this. Eye-opening stuff. I thought these films were brilliant, and very informative. Hearing directly from people with learning disabilities and mental health problems helped show the benefits being felt by the employers as well as the employees. There was a really positive sense that mental health problems do not get in the way of being extremely valued in the work place. I really enjoyed these films and will let other people know about them. They clearly set out some absolutely crucial messages – including that people with learning disabilities and mental health issues are effective and loyal employees. It was great to see so many doing good jobs and enjoying their work, and to hear directly from them.